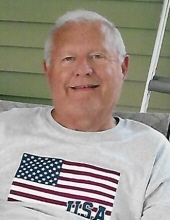 FISHWICK, James Frederick - Age 80, of Fenton, died Saturday, March 16, 2019. Funeral services will be held 12:30 PM Tuesday, March 19, 2019 at Sharp Funeral Homes; Fenton Chapel, 1000 Silver Lake Road, Fenton. Pastor Jeff Jaggers officiating. Burial immediately following at Great Lakes National Cemetery, Holly. Visitation will be held at the funeral home Monday from 5-8 PM and Tuesday from 10:30 AM until the time of the service. Those desiring may make contributions to Fenton United Methodist Church or Adopt-A-Pet. James was born February 2, 1939 in River Rouge, the son of George and Ethel (Guenther) Fishwick. He was a 1958 graduate of Flint Central High School. He was a veteran of the U.S. Army. He married Mary C. Bradley May 6, 1961 in Flint. James retired in 1995 from GM Fisher Body Ternsted as an Engineer. He was a member of Fenton United Methodist Church. He was a scout leader and was in the big brothers program; and coached hockey and baseball. He had a passion and talent for woodworking. Surviving are: his wife of 57 years, Mary; 3 children, Mark (Olga) Fishwick of Brighton, Teri Kinney of Linden, and Dale (Tammy) Fishwick of Fenton; grandchildren, Bryan, Blake, Christian, Alisa, Chad, Edward, Darien, and Drew; brothers, Douglas (Colleen) Fishwick of Davison and David (Maggie) Fishwick of Brownstown; and several nieces and nephews. To send flowers or a remembrance gift to the family of James Frederick Fishwick, please visit our Tribute Store. "Email Address" would like to share the life celebration of James Frederick Fishwick. Click on the "link" to go to share a favorite memory or leave a condolence message for the family.